News reaching michezoafrika.com newsdesk indicate that AFC Leopards coach Chris Makokha has resigned. This follows extreme pressure after series of poor performance by the club with the widest and most fanatical fan base in Kenya. Reliable sources indicate that immediate former Sofapaka coach Robert Matano is the front runner to replace Makokha with Dino Kitavi poised to take over as the Assistant Coach.Razak Siwa will be the new goal keeper trainer. Matano had a good run last season winning the league and was named the KPL coach of the year. Other shortlisted candidates include veteran Tom Olaba. 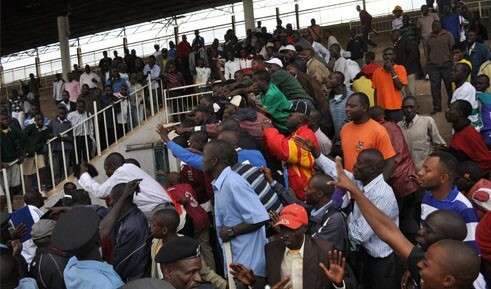 AFC Leopard has had a better league run this season as compared to last season when they had to fight against relegation but they have not been able to match up with perennial rivals Gor Mahia who are currently ranked third in the KPL League standings.The new coach will be expected to turn around the dwindling fortunes of Ingwe to its "repectable position". Keep it michezoafrika.com for the latest on this and other breaking stories.